When the fixture lists are released in June most Villa fans look to the first, last and derby games before anything else. The first thing I do is look for when we play Manchester United, as this fixture in particular means more to me than any other. My dad, born and bred in Salford, went to his first Manchester United game when he was 6 years old. 12 years later he had a season ticket. Add 30 more years to that and you’ll find him walking a 6-year-old me down Sir Matt Busby Way to watch my first game at Old Trafford. Just like him, I pledged my allegiance to the first team I ever saw. Fortunately, it wasn’t the home team. The Reds beat John Gregory’s Aston Villa 2-1 that day with David Beckham, one of my heroes, scoring a wonderful free kick. All the signs led to me following in my father’s footsteps but according to him, the only team I could talk about was the Villa. My Dad continued to buy me United shirts every single birthday and when I was around 10 years old he told me in no uncertain terms that I couldn’t support 2 teams. I picked Aston Villa (probably in spite of him telling me what to do) and the bond between me and my team grew stronger and stronger. By now I was supporting the team, I was pretending to be Darius Vassell in the playground and I was claiming I hated ‘the bluenoses’ without even having a clue who they really were. 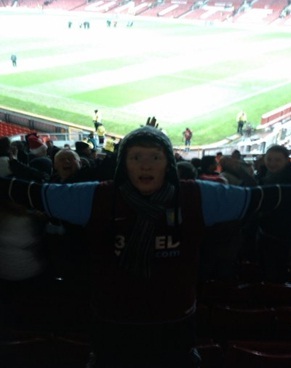 At 12 years old, having pestered my Mum (not my Dad) for years, I finally got the chance to go to Villa Park. I can remember so much of that day. 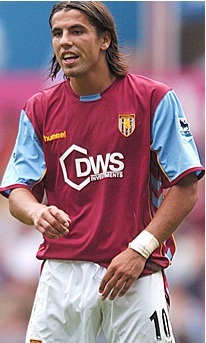 The walk up to the ground past the church, visiting the club shop and buying that horrible yellow DWS sponsored away strip, and getting my free Baros 10 on the back (as he was making his debut that day). As was written in the script Milan scored, we beat Blackburn 1-0 and I walk away thinking I’ve made a pretty good life choice. It’s not often you can claim to have a legitimate reason to support Manchester United, and it was always difficult explaining in the playground why I wasn’t wearing red or blue like everyone else. I never quite managed to shrug off the affiliation with the club however, and in 2007 I was offered the chance to work there as one of fourteen ballboys for the 07/08 season. For a year I sat in a dressing room next to Ronaldo, Scholes and Rooney but the most star struck I ever got was waiting in the tunnel next to Martin Laursen. He pulled his shorts right down to his ankles to adjust his spandex and I’ve never been happier to stare at a blokes arse. Despite the unbelievable experience and the amazing way in which we were treated by Ferguson and the football club, there was never a moment in which I ever felt like I supported United. Plus it also gave my Dad some pleasure as he got a free front row season ticket in the Stretford End and a chance to see me celebrating on the pitch with the players when they beat Barcelona 1-0 to reach the Champions League final. 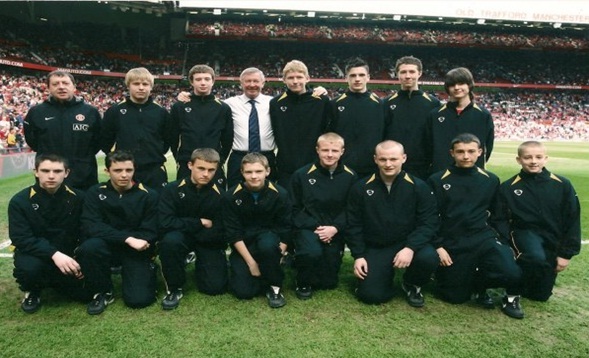 Standing fourth from right (back row) next to Sir Alex. I usually did my best to make his tea deliciously milky. Tonight, I want my team to leave a bitter taste in his mouth. Being Mancunian Villans, it’s hard to consistently walk away from nothing against the red half, and now even the blue half of the city. In 2009 my pal and I were not expecting too much when we arrived at Old Trafford. We met up with mates from school we knew outside the ground but they soon all disappeared in the home end whilst we walked past the Munich clock and into the gates of the away section. The feeling when Agbonlahor wheeled away to celebrate will be very hard to replicate again, and I’ll always remember the 20 minutes after the game when Villa fans sung to an empty Theatre of Dreams in celebration of our 1-0 victory. Beating United really is a dream for the pair of us and it means as much as beating the Blues because of our background and the kind of stick we endure four times a season.